Deutsche Kunst-Austellung, Dresden, 1899, no. 320. Kollektion Karl Mediz und Emilie Pelikan,Hagenbund, Vienna, February 1903, no. 21. Emilie Pelikan – Karl Mediz, Galeriegebäude auf der Brühlschen Terrasse, Dresden, September 18 – October 23, 1943, no. 28 (label on verso). Ludwig Hevesi, “Karl Mediz – Emilie Mediz-Pelikan,” Zeitschrift für Bildende Kunst, 1903, p. 208, ill. p. 207. Ibid, Österreichische Kunst des 19. Jahrhundert, vol. 2, 1848-1900, Leipzig, 1903, pp. 318-319. Robert Bruck, Karl Mediz, Dresden, 1904, pp. 31-34, 42, ill..
A. S. Levetus, “Two Austrian Painters: Karl Mediz and Emilie Mediz-Pelikan,” The International Studio, no. 98, April 1905, p. 98. Rupert Feuchtmüller, “Aus dem Dunkel des Vergessenseins – Zu Leben und Werk von Karl Mediz und Emilie Mediz-Pelikan,” Alte und Moderne Kunst, Salzburg, 1985 (reprints Hevesi’s 1903 article), pp. 51-52. Oswald Oberhuber, Wilfried Seipel, Sophie Geretsegger, Emilie Mediz-Pelikan und Karl Mediz, Katalog zu den Ausstellungen im Österreichischen Museum für angewandte Kunst, Landesmuseum, Vienna and Landesgalerie, Linz, 1986-87, pp. 10-11,17, and 266, no. 58 (not Illus.). Karl Mediz was one of the most fascinating artists who flourished in Austria and Germany in the late nineteenth and early twentieth century (figs. 1a and b). Born into a merchant family in Vienna, he grew up living with an aunt in Znojmo, a town in southwestern Moravia, and worked for his uncle in the sister city of Retz in Lower Austria. His artistic talent was recognized by the leading Viennese court painter, Friedrich von Amerling, and so he entered the Vienna Academy of Fine Arts in 1884, studying with Christian Griepenkerl and Fritz L’Allemand. He then continued his education with Paul Hermann Wagner and Alexander D. Goltz in Munich. This was followed by a period of study at the Académie Julian in Paris where his masters were Bouguereau and Robert-Fleury. Then in 1888 he spent time at the artist’s colony at Dachau, Bavaria, near Munich with such artists as Adolf Hölzel and Fritz von Uhde, but most importantly there he met fellow artist and his future wife, Emilie Pelikan (b. 1861, fig. 2). They travelled together to Paris and Holland, visiting the artist’s colony in Knokke. They married in 1891 but despite positive support from art critics could not earn a decent living in Vienna. After study trips to Hungary and Italy, they settled in Dresden in 1893.That year both of them were represented in the first exhibition of the Munich Secession. They likewise both exhibited at the first Secession Salon in Vienna in 1898. Between 1902 and 1912 Mediz was a member of the progressive Hagenbund group of Vienna, and he and his wife were given a joint exhibition by this organization in 1903. She died suddenly of heart failure in 1908, aged only forty-seven. After this Mediz became reclusive and created primarily graphic works and just a few portraits, morbid allegories, and flower subjects. He died in Dresden shortly before or during the Allied bombing of the city. Fortunately his works survived and the estates of both artists were controlled by their daughter, who forbad any exhibitions of their works, and only after her death where they transferred in 1975 to the Gerhart-Hauptman Museum in Radebeul, Austria. Then the estate was purchased and distributed by the Viennese art dealer Kurt Kalb in 1985. The following year the almost forgotten artists were made better known by a major posthumous exhibition in Vienna and Linz. Although he and his wife both created richly representative landscapes, it was in depictions of local customs as well as inventive allegorical themes that Mediz made his mark. His works, as observed already in 1903 in a major article reviewing the Hagenbund exhibition by the distinguished Viennese critic Ludwig Hevesi (1843-1910), revealed influences from or similarities to a number of contemporary artists who also depicted in highly realistic form regional types, landscapes, and religious and symbolist subjects. These included both the Swiss painter Ferdinand Hodler and the Italian Giovanni Segantini (figs. 3a-b), as well as Max Klinger, Arnold Böcklin, Fritz von Uhde, Hans Thoma, and Wilhelm Leibl (figs. 3c-g). In addition to these well-known artists, it is interesting to observe that in the 1899 Dresden exhibition, where the present painting was first shown, there were several other works also representing church goers and religious figures (figs. 4a-b). Of all these various sources, the most influential was undoubtedly Hodler, who painted both figures in the forest (fig. 5a) and large-scale, often controversial, allegorical compositions, that Mediz might have seen either in person in Vienna or Germany or in reproduction. In 1903 Hodler was in Vienna and received there a one-man exhibition at the Hagenbund just before that given to Mediz and his wife. Hodler’s early works indeed included somber, monumental paintings of life-size figures lined up across the front plain of the compositions (figs. 5b-d), but in place of the Swiss artist’s universal allegories, Mediz was more concerned with documenting regional Austrian types or scenes. He had previously displayed this interest in capturing local customs and styles of dress in both paintings (figs. 6a-d) and also in his highly finished drawings (figs. 7a-d). These two artists are man and wife; they have wandered in many places together, over the highest mountains and across glaciers, on the banks of deep rivers and on their pilgrimages have painted scenery and portraits and everything else between. They have endured the greatest hardships together and have worked together; they have chosen the same subjects for their canvases, yet their individualities remain…Of the two, Karl Mediz is more monumental; he works with a great and massive concentration, and yet with a poetry of expression, a real German energy, an energy which he has inherited from his forefathers, who settled on Austrian territory, in the Duchy of Gottschee, in South Carinola, a century ago, but who yet keep their old German traditions…In the Gottscheerinnen, the artist depicts the women of that village in Carinola, where the old Germans settled there still dress as they did centuries ago. The peculiar head-dresses, long sleeveless paletots falling below the knees, and knife-pleated white muslin dresses under, the rare old lace collars and ribbons, which have been in and out of fashion, make the picture very interesting and the coloring is very delicate. The grouping is exceedingly well arranged, and this may be said of all his work. The title of this painting as given by Levetus and used on its earliest exhibitions in Dresden and Vienna was Gottscheerinnen (Gottscheer Women)and only for the 1943 exhibition did it receive the fuller title employed here, Sonntagsgang der Gottscheerinnen (Sunday Procession of Gottscheer Women). One would imagine that Mediz had approved of this at the time, but still wonders if this is actually an ordinary Sunday procession or some other more special occasion or ceremony, perhaps around Easter time. The Gottscheers, as also indicated by Levetus, were an ethnic German minority who lived from the 14thcentury primarily in Gottschee, in the province of Carniola in present day Slovenia. It is estimated that in the later part of the 19thcentury there were 26,000 Gottscheers living there, with their own customs and speaking their own German dialect. With the end of the Hapsburg Monarchy in 1918, Gottschee became part of the new Kingdom of Yugoslavia, where they remained until the region was placed under Italian occupation and the Nazi regime demanded they be reunited with Greater Germany by a forced expulsion to the Rann region in Lower Styria. This did not work out well, and after the end of World War II, when they returned to Yugoslavia, they found their homes and villages destroyed. Thus, most of the Gottscheers emigrated, some to Austria, but most to America, settling in the New York City and Cleveland areas. This is one of three monumental paintings that Mediz produced in the late 1890s and first years of the 20thcentury, documenting, in an almost ethnographic manner, specific groups of Austrian peoples. The others, both now in the Belvedere, Vienna, are the 1898 Stone Carriers of Ragusa(fig. 8a), which is 171 x 261 cm and was presented to the museum in 1984 by the same Viennese dealer, Kurt Kalb, who owned the present work; and the 1901 The Ice Men (fig. 8b), which is 214 x 253 cm and was acquired almost immediately from the Hagenbund in 1902 by the nascent Moderne Galerie. Ragusa located on the rocky Adriatic coast, known as the Austrian Riviera, was the setting for other scenes and also landscapes by Mediz (fig. 6b). The Ice Men depicts actual portraits of a group of East Tyrolean men. Whether the painter intended these works to function as a kind of gigantic triptych is uncertain. They do not seem to have ever been exhibited together by him. In her pioneering article, however, A. S. Levetus makes a curious connection, stating (with information ostensibly obtained from the painter) that the old woman in the present painting is 90 years old and that the oldest man in The Ice Menwith the long white beard reaching almost to his knees and leaning on a stick is also ninety. This is an extremely important work and was significant enough to be singled out for mention in Hevesi’s landmark survey of 19th-century Austrian art. Mediz’s intensity, evident in the 1896 portrait by his wife (fig. 1a), has been channeled into the almost disturbingly real presence of the women in this haunting tableau. He has focused on a ceremonial, religious procession in which they are dressed in their traditional garb (seen for example in period photographs, figs. 9a-b) of pleated white skirts, over which are worn green-blue coats. On their heads are white scarves and around their necks are lace-trimmed collars and hanging in front are the bows of shawl-like scarfs decorated with floral patterns. The solemnity of the scene suggests, as previously noted, that it is more than just an ordinary outing, but rather a special occasion. There is also clearly a symbolic or allegorical message being conveyed. Leading the silent group is the old woman walking with a large staff. She is separated by a slender, yet flourishing, birch tree from the group of younger women. The first of these holds a stem of white lilies. A lily is also held by the youngest girl in the center who unlike the others does not wear one of the blueish-green coats and is bare-headed. Perhaps this indicates that she and the one other youngest girl at the far right are either unconsecrated or unmarried. One other woman holds a bouquet of purplish poppies and the second to last woman holds a fine lace handkerchief. The gestures and attitudes of the group convey deep humility and suggest the spirituality of their outing. The faces are each individualized and express deep emotion and great sensitivity. The landscape of Carniola with its verdant fields, clear skies and distant mountains serves as a backdrop to this almost theatrical presentation. Mediz is such a skilled painter of nature and detail that he captures the texture of the single birch tree, which seems to separate old age (if not death) from youth (and life). Like Hodler (figs. 10a-b), Mediz displayed a marked attraction to the symbolic presence of trees investing them with a near mystical presence (figs. 11a-f). Towering trees were one of the most powerful motifs in many of his works (figs. 11g-i), including one 1897 painting of a mysterious grove of birch trees titled Gottscheer Zwegenwald (Gottscheer Dwarfs Forest, fig. 12), suggesting that for Mediz the Gottscheer connection aroused a profound mystical strain. The other two monumental paintings by Mediz (figs. 8a-b), both depicting only men, also have a processional arrangement across a broad space with very little setting or background detail; but while they convey a sense of dedicated labor, they do not radiate the distinctive spirituality of the present work. Its boldly delineated figures marching across the pictorial space evoked in contemporary accounts comparison to Giotto’s frescoes at Padua (fig. 13), and the Gottscheers’ stately progress makes a convincing case for this. 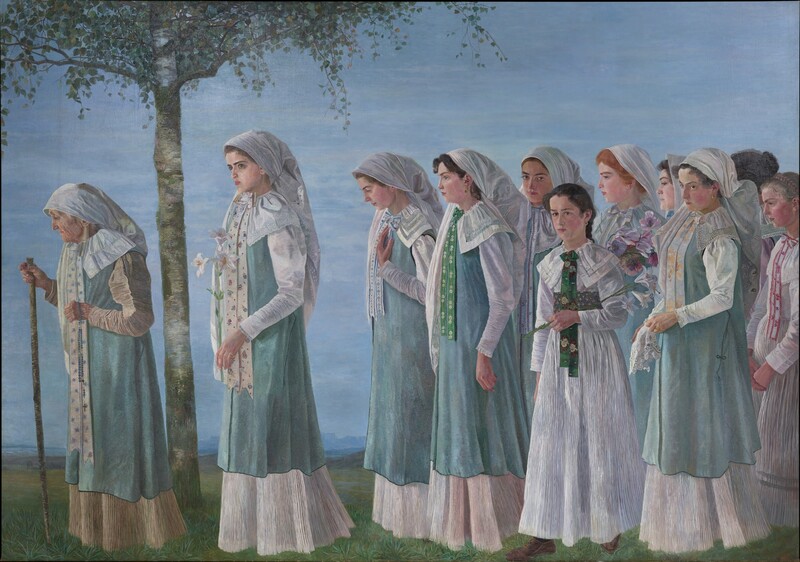 The first commentators on this painting also noted that Mediz’s father was a Gottscheer and that some of the young women in this painting were family members. This would explain his interest, but he could hardly have known that his painting would become a record of and a monumental memorial to a now almost-vanished way of life and culture.